Sagenda Events Patterns: When Is Your Service Available to Clients? Events Patterns define the availability of your service during a specified period of time. Sagenda events patterns are always connected to a bookable item or to bookable item lists. An event pattern refers to the timeframe in which a service that you have previously defined in your bookable items becomes available to your clients. Whenever your clients search for your service and availability, the search results will reflect the available dates based on the overall bookings and limitations of your service. As with bookable items, you may always define multiple event lists based on your bookable item lists reflecting the availability of your range of services to potential clients. Log in to your Sagenda dashboard, click on Events Patterns and choose the Add Event Pattern from the left drop down menu in order to select the availability of your service. Date and Time: define the date and time for your service. A service may be booked for an entire day, a couple of days or only for some hours in a day or over a period of time based on a specific schedule. 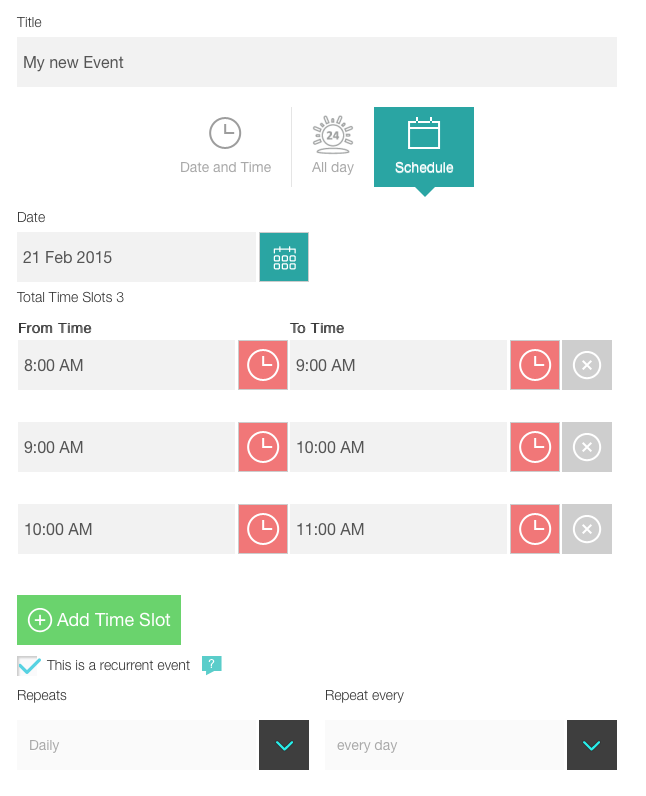 Schedule: defines the time slots in which your service can be booked. Recurrent event: check the box in case your service is available repeatedly. For instance, a specific concert entry might be available only once, while room reservations are possible throughout the entire year or only during the winter season. Bookable item: select the Bookable Item or Bookable Item Lists to which the Event applies in order to define the availability of your service or business. The pattern may apply to specific services or to all your business.